The Theatre Guild was founded in New York City in 1919 by by Lawrence Langner, Philip Moeller, Helen Westley, Maurice Wertheim, Lee Simonson, and Theresa Helburn. Langner’s wife, Armina Marshall, then served as a co-director. It evolved out of the work of the Washington Square Players. The Theatre Guild departed from the usual theatre practice in that its board of directors shared the responsibility for choice of plays, management, and production and is known for the production of high-quality, noncommercial American and foreign plays. Following the world premiere of George Bernard Shaw’s Heartbreak House in 1920, The Theatre Guild became Shaw’s American producer, producing 15 of his plays, including world premieres of Back to Methuselah and Saint Joan. Eugene O’Neill’s long association with The Theatre Guild began with its production of Marco Millions in 1928. Other American authors whose works were produced by The Theatre Guild included Sidney Howard, William Saroyan, Maxwell Anderson, and Robert Sherwood—all Pulitzer Prize winners. Many distinguished actors appeared in Theatre Guild productions, including Helen Hayes in Caesar and Cleopatra and Alla Nazimova in Mourning Becomes Electra. 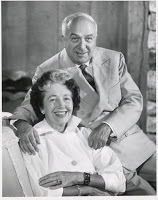 Lynn Fontanne and Alfred Lunt first acted as a team there in Ferenc Molnár’s Guardsman and went on to act together in many other notable Theatre Guild productions, such as Arms and the Man and The Taming of the Shrew. The Theatre Guild contributed significantly to American musical theatre by producing George Gershwin and DuBose Heyward’s Porgy and Bess and by bringing Richard Rodgers and Oscar Hammerstein II together for a whole new era of Broadway musicals with as Oklahoma! and Carousel. The “Theatre Guild of the Air” (1945–63) presented a distinguished record of radio and television play productions, and The Theatre Guild’s subscription series enabled audiences in 23 cities from coast to coast to see its major attractions and those of other producers. The Guild has produced a total of 228 plays on Broadway, including 18 by George Bernard Shaw and seven by Eugene O’Neill. Other major playwrights introduced to theatre-going Americans include Robert E. Sherwood, Maxwell Anderson, Sidney Howard, William Saroyan, and Philip Barry. In the field of musical theatre, the Guild has promoted works by Richard Rodgers, teamed with both Lorenz Hart and Oscar Hammerstein II, Georgeand Ira Gershwin, Jule Styne, and Meredith Willson, all of which have become classics. Under President John F. Kennedy, the Guild was engaged to assemble a US theatre company, headed by Helen Hayes, to tour the capitals of Europe and South America with works by Tennessee Williams, Thornton Wilder, and William Gibson. Since 1996, The Theatre Guild has been producing theatre tours throughout the United States, including Jean Stapleton as Eleanor Roosevelt for 37 weeks; Ed Asner as FDR for the last 5 years in over 100 theatres throughout the country and Loretta Swit in a revival of Eleanor Roosevelt for the last two years—both of which are continuing productions next season. In 1968, the Guild became involved in the travel field by taking 25 of its subscribers to European capitals to see plays. In 1975, it instituted its Theatre At Sea program with a 17-day cruise aboard the Rotterdam with Hayes and Cyril Ritchard. Since then they have hosted thirty-five cruises, each with seven or eight performers. Among them have been Alan Arkin, Zoe Caldwell, Anne Jackson, Cherry Jones, Richard Kiley, Eartha Kitt, Patricia Neal, Lynn Redgrave, Gena Rowlands, Jean Stapleton, Eli Wallach, Lee Roy Reams, who served as the program’s resident director, and Ronald Nash, who currently serves as our theatre manager. The Theatre Guild contributed greatly to the success of Broadway from the 1920s throughout the 1970s, continuing on today with our focus the same as it’s always been—to provide great theatre productions. Hi, I just wanted to confirm if this is still an active email that we can contact you at. Thank you. Hi Gao that is still our email–we look forward to hearing from you! I’m a televisionresearcher and looking for footage of Duke Ellington – A drum is a woman. It has appeared in season 4 of the United States Steel Hour. It has been broadcasted in 1959 on CBS but was produced by the Theatre Guild. Can someone help me in my search? Thanks for your comment. We will do some checking and see what we can find for you! Same question here. “A Drum is a Woman” aired on the US Steel Hour on May 8, 1957, about a year after the LP was released on Columbia Records. I’d be interesting in knowing who the cast members were in the Theater Guild TV production. According to the IMDB, “A Drum is a Woman” aired on the US Steel Hour on May 8, 1957, about a year after the LP was released on Columbia Records. Would like to know who the members of the cast were in the Theater Guild TV production. I like the logo. But if it’s such an important organization, why does it have such a bare-bones website? Has it gone into decline over the past few decades?